Libraries are in a period of fundamental change and new strategic partnerships and use of space can create opportunities. Libraries offer a wealth of spaces for creative scholarship and making with both digital and physical resources. Incorporating incubator lab space for digital humanities projects or online curriculum development can be a catalyst for change. In addition to core services, more engagement in consulting to research teams and increasing involvement in teaching are other manifestations which may have spatial requirements. 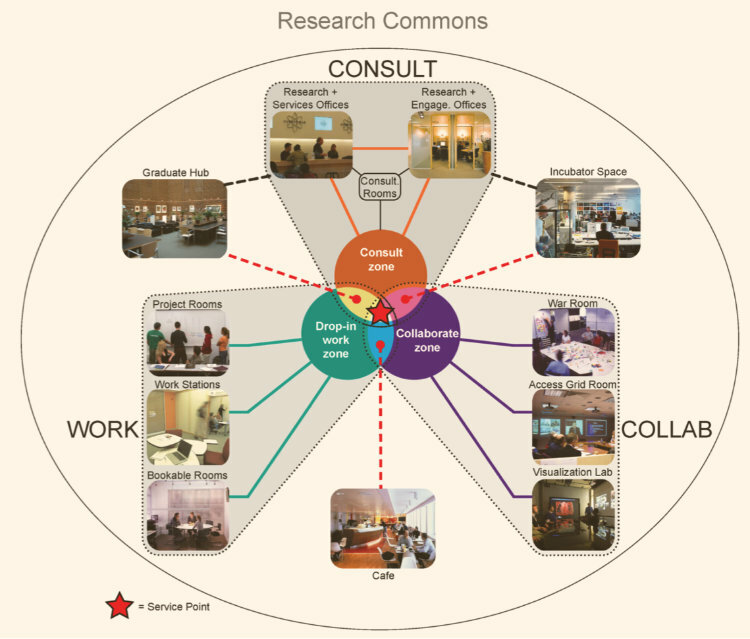 As part of a strategic space plan for the library system of a major research university, we examined the distribution of existing facilities and services points across the campus that support diverse innovation and entrepreneurship activities. Mapping the distribution, facility types and accessibility made them more visible and provided insights into where opportunities lay for the library system to introduce new facilities, training and consultation services available to all disciplines. Libraries are examining their existing facilities, often located at the heart of the campus, to gain more effective space for their students, faculty and researchers. Libraries are welcoming to all and as neutral space, can offer an academic crossroads to support transdisciplinary work and teaching. A master plan for the University of Massachusetts-Amherst Libraries developed a vision for space reallocation and renovation that would enhance study and commons spaces, integrate model teaching venues, and offer services with multiple partners at center of the campus, all in facilities managed by the library late into the evening. “Future of the Library? : Turning Conflicting Pressures into Compelling Opportunities”, S. Dugdale, L. Pavlova and J. Schafer, SCUP conference presentation, July 2011. User research and participatory design methods are now recognized as valuable to library planning and helpful for defining user needs. Interest in digital humanities work is growing, in which scholars and students interact with textual data in new ways and integrate media. Visualization facilities enable researchers to generate insights with new perspectives. Makerspaces provide places for students to tinker and integrate making into their learning experience. But providing quiet space for concentrated work will continue to be a highly valued asset of libraries to all types of campus users. The James B. Hunt Jr. Library at North Carolina State University was conceived as a dynamic library that would enable its users to work with a rich blend of technology-enhanced facilities available to everyone. The Teaching & Visualization Lab, Creativity Lab, Gaming Development Lab, and the Immersion Theater with its curved screen were innovative spaces programmed to foster new ways to teach, create and collaborate. As Director at DEGW, Shirley Dugdale was involved with the team to help craft the programming strategy. At the OCLC Partners’ Meeting in Oct. 2015 on The Library in the Life of the User, Chicago, Oct. 2015 Shirley Dugdale addressed “Learning About Future Users”—suggesting that ethnographic research techniques such as investigating extreme users are helpful to gain insights that may not be apparent from observation of today’s library use. “Digital Scholarship & the Evolving Library,” S. Dugdale, A. Harrison, C. Kainz and K. Miller, presentation at SCUP conference, July 2008. The 21st century promises to challenge society to make use of data to address complex problems and advance policy, science, social causes, and the economy. Education in many disciplines may now involve collecting field or sensor data, applying geospatial systems to projects, exploring new forms of digital scholarship, and querying open source datasets to develop new insights or products. Higher education institutions may play an important role by integrating data science across their curricula. To do so requires interdisciplinary approaches and new collaborative settings to support visualization and learning to work with data, well suited for libraries. Libraries’ data services include data management planning, consultation on GIS software and applications, and partnering to offer services such as training in data visualization. Complementing what is offered elsewhere on campus, libraries can become a key locus for these information services. In order to repurpose space from stacks to study seating, many libraries are shifting lesser used and fragile print materials to high density storage facilities. This provides better environmental conditions and an opportunity to consider an appropriate size for the browsable collection to remain on campus. 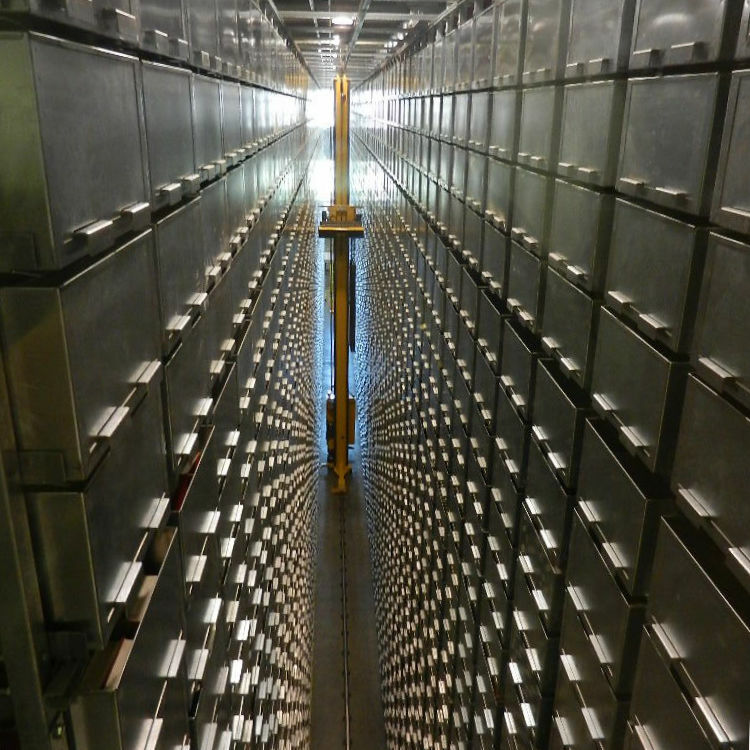 Multiple storage options need to be considered, including high density compact volumes with automated storage and retrieval systems, either on or off campus. In preparation for renovation, the Johns Hopkins Milton S. Eisenhower Library analyzed data about their collections usage over the last fifteen years and concluded that a significant portion of the collection could be accommodated off-site without impacting users, opening up exciting opportunities for new kinds of spaces and seating with renovation. We assisted with analyzing the planning implications and projected stack capacities needs. Libraries are developing new service models as the focus shifts from access and preservation to creation, dissemination and curation of digital scholarship and research, reframing roles and outreach. Service points are more approachable and user friendly, often offering integrated services with partners. The Welch Medical Library of Johns Hopkins University in 2002 had an early vision for distributed services with mobile informationists consulting to clinical and research teams. For the master plan, Shirley Dugdale developed a space strategy aligned with this future service model, conceived as a network of distributed touchdown suites as venues to meet and consult with teams across the medical center. "The Library of the Future: Interweaving the Virtual and the Physical”, N. Roderer, K. Brandt, S. Dugdale, J. Hurd, and B. Wildemuth, ASIST (American Society of Information Sciences & Technologies), 2002.